It is essential to human nature to be able to think critically and creatively. Our ability and tendency to think critically and carefully takes precedence over content knowledge, not only in the classroom but in the wider world around us. There are thought to be three different modes of thinking: lateral, divergent, and convergent thought. Convergent thinking (using logic). This type of thinking is also called critical, vertical, analytical, or linear thinking. It generally refers to the ability to give the “correct” answer to standard questions that do not require significant creativity. This includes most tasks in school and on standardized tests. Convergent thinking is the type of thinking that focuses on coming up with the single, well-established answer to a problem. When an individual is using convergent thinking to solve a problem, they consciously use standards or probabilities to make judgments. Divergent thinking (using imagination). This type of thinking is also called creative or horizontal thinking. It is a thought process or method used to generate creative ideas by exploring many possible solutions. When a student uses divergent thinking, thoughts typically occur in a spontaneous, free-flowing way. Many possible solutions are explored in a short amount of time, and unexpected connections are more easily drawn. After the process of divergent thinking has been completed, ideas and information are organized and structured using convergent thinking. Lateral thinking (using both logic and imagination). This type of thinking is commonly referred to as “thinking outside the box.” It involves solving problems through an indirect and creative approach, using reasoning that is not immediately obvious and involving ideas that may not be obtainable by using only traditional step-by-step logic. 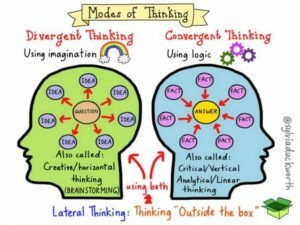 To understand lateral thinking, it is necessary to compare convergent and divergent thinking and build a working relationship between the two types.